The excursion begins by picking you up from the designated locations (which are available on the site). At approx. 10:00 we arrive at Knossos archeological site where we will stay for the next two hours. The Palace of Knossos was built in 2000 BC. 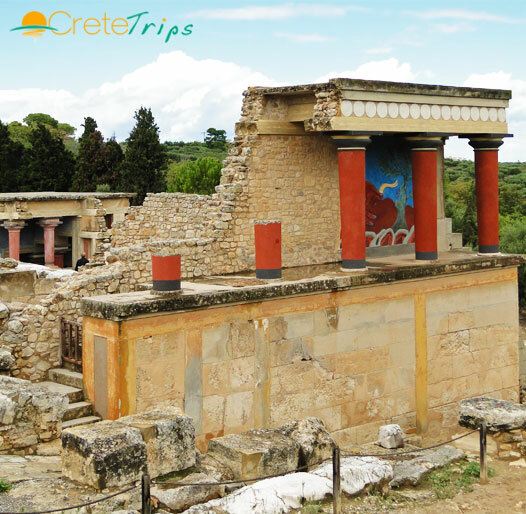 Knossos was the prosperous Minoan Capital and the residence of King Minos. Some believe, that the intricate Palace with its many rooms was the mythical labyrinth. By discovering the site not too long ago, archeologists found the first of all advanced civilizations in Europe. At around 12:00 we will leave the archeological site and head to the Center of Heraklion City. There, our visitors will have the pleasure to visit the archeological museum of Heraklion where you can see the largest collection of Minoan findings from Crete. They will also have the chance to take a short walk in the city center. At 14:45 we depart from Heraklion city heading back to Rethymno. You are expected to return to your hotel at around 16:30 although the time of arrival varies depending on your destination. At 14:45 we depart from Heraklion city heading back to Rethymno. You are expected to return at your hotel at around 16:30 although time of arrival varies depending on your destination. Half-day guided tour to the most well-known archeological sight of Crete. Enough free time in Heraklion for shopping, having lunch and visiting an archaeological museum. Transport to and from Knossos Palace-Heraklion City. Experienced English-German speaking guide every Wednesday, and English-Russian speaking guide every Saturday.